Be Clean, Go Green! We love this salad – please make it and tell us how much you love it, too! Sauté the zucs until soft in olive oil and all the garlic. Add the quinoa, cover with water, and cook, stirring occasionally. When done, add the remaining ingredients. Taste and adjust to your heart’s content. To prepare the quinoa for maximum health: soak quinoa for about 1 hour, rinse, and then put in a sieve or colander to sprout. When sprouting, put in a spot away from direct sunlight and heat (70 degrees is optimal spouting temperature. Since it will take some time to sprout, you can leave overnight. 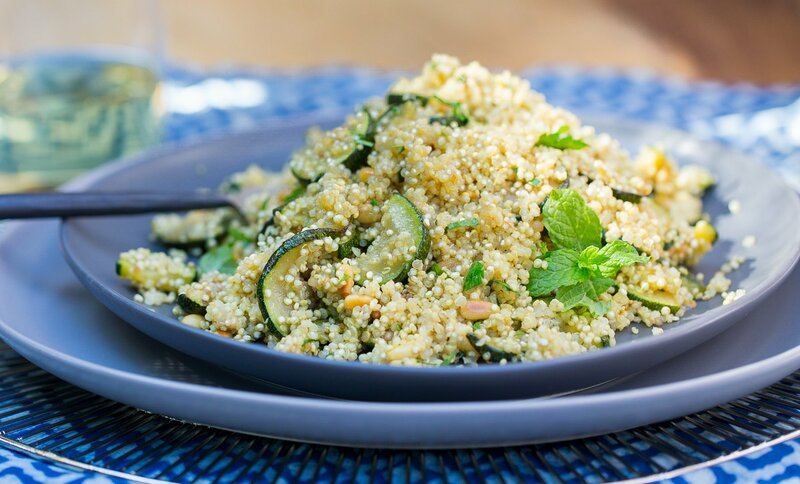 Rinse and drain in the morning – you will see quinoa with cute little tails!